Things were better in the morning. The young guys who ran the hotel made us a nice breakfast. Our choice of hot milk or water with instant coffee, juice, scrambled eggs and white rolls . . . again! Lots of backing and forthing, better to leave the ipods in the luggage left in hotel or carry it into the jungle to get rained on. Hard to decided, but fi nally the ipods were stashed in our luggage and we gave the receptionist guy an extra 5 dollars. Jonathan took Jules out early to get boots. The merchants were scratching their heads at the request for a size 481/2 rubber boot, calling out to their friends – hey, look at the size of this sneaker! Jules squeezed his foot into the 45 and we decided it would be ok in a pinch and threw them into the backpack. Tsunki did arrive at 9:00 as promised, but then we went with him to a bakery and sat and waited for him to get a few more things until 10:30. It was n’t so bad because we got to people watch and talk to Linda and Victoria and hear all about their lives. Sisters in their mid twenties, they both studied in Macas where they worked while they were attending school. Now their brother is attending the same school. 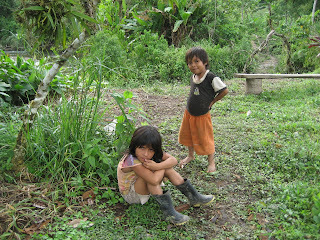 They said it was a good school, but there was still a lot of racism that exists against the Shuar. Linda studied social studies and is now an adult literacy instructor living in Macas. Victoria, Tsunki’s wife, studied agronomy and now dreams of starting a cinnamon plantation on her father’s land. 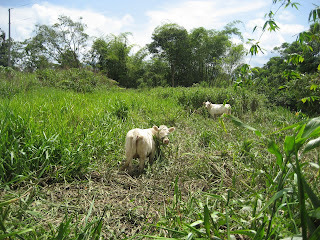 She has it all figured out and only needs about $500 to plant one hectare of trees. Although this is just the sort of entrepreneurial endeavor we are fond of supporting, we were only momentarily tempted to just hand her the money. 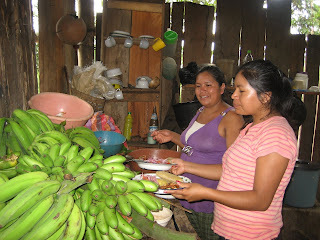 Victoria and Linda have 10 siblings and their father, Jose, is the shaman whose home we will be visiting. Jose is originally from Peru and became a shaman because his mother died when he was only 2 months old. His survival was viewed as a sign that he should be raised as a shaman. He has passed his knowledge onto one of his older sons, but that son feels it is much easier to work in the hardware store in Macas. Finally, finally, Marcelo the taxi driver pulls up in a taxi yellow pick-up truck. We throw our bags in the back along with the women and children and my family rides in the cab with Tsunki. We go about 2 blocks and stop and wait for Tsunki’s in-laws for some unexplained reason because they aren’t going with us yet. 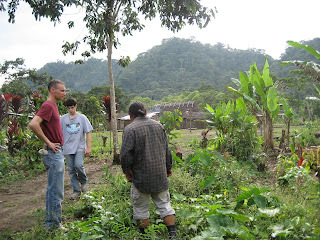 After about twenty minutes waiting and chatting, we leave Macas for the jungle. 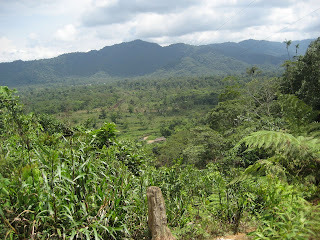 It is about a 20 minute drive on the main highway and then we turn off the road on to a dirt road toward the village. The road passes fields and gets steeper and muddier. After about 40 minutes we all pile out of the car at the bridge. 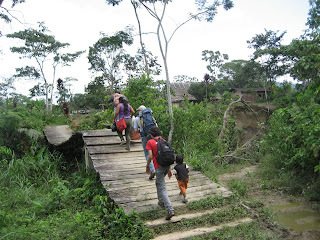 Tsunki goes across the plank covered suspension bridge to check it and then we all walk across. 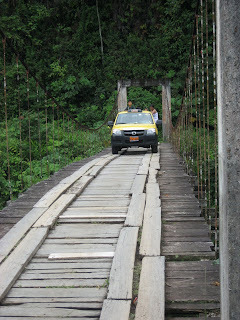 Then Marcelo drives across and we climb back in and continue up the mountain aways to a small settlement. Marcelo lets us out there and we take our stuff. Linda pulls on her rubber boots, but turns out they actually didn’t bring any for us. It’s not raining anyway, so its not a big deal. 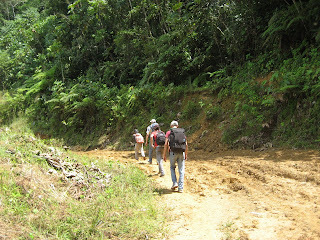 We walk up a very muddy road for a while and then cut up a path over the mountain. Steps have been worn into the clay so it is pretty easy to climb, but it is straight up. Along the way, we meet people going both ways heading into or out of town carrying their things in a bag over their shoulders. We stop and shake everyone’s hand as we meet them and say good-bye. 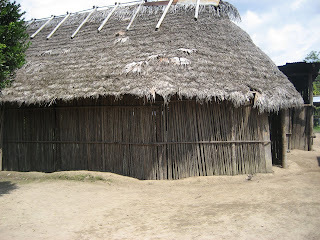 compound comprised of a few wooden houses and a bamboo guest house with thatched roofs. The houses were around a big muddy field that had a volley ball net across the middle and soccer goal posts at both sides. One wooden house was a big kitchen with a fire in the middle where Victoria had quickly got to work putting parts of a freshly slaughtered chicken on the fire to grill with her bare hands. Instead of cutting the wood into fire circle sized pieces, the fire was fed with huge, long logs that they kept moving to feed the fire as they burned up. ed on their sleeping platforms. 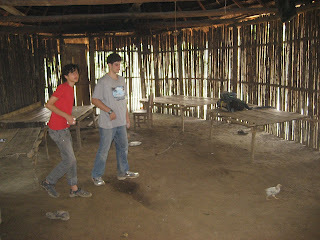 Jonathan eventually went to ask about bathrooms and was told they just use the jungle. I drank less water and tried not to think about snakes. ortedly chewed and spat into a bowl to get it going. He sent his Tsunki Jr. to go get some and he came back with a gourd full. Tsunki took a drink, passed it to Jonathan who took a tiny sip, then me then Noah. Jules declined and Tsunki Jr was taking large gulps. It tasted like yeast water and a little like beer. 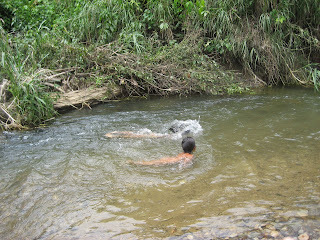 didn’t want to swim because of the proximity of live stock (two enormous oxen) to the river and their fear of snakes and parasites. the sick person according to the insight he has gained. 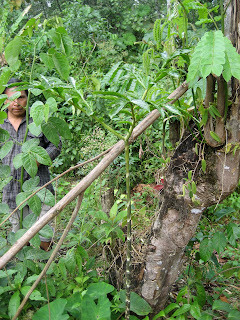 He has a wide knowledge of rainforest medicine and knows which plants have the required effect on his patients. recreational drug and boy are they sorry when they start vomiting and don’t get out of the trip for 5 days. We also saw all of the various snake bite plants. Tsunki assured us that he always carries leaves with him when he is with tourists. Once a Polish woman got bitten by a snake and he administered the l eaves every half hour until they got her to the hospital in Macas. She was fine. How much time do you have, I asked warily, thinking back on how long it took us to get in? Well it depends on the snake, he said. With an equis you’re a goner in a few seconds. We were relieved to hear he hasn’t lost a tourist yet.